With its new Escape, Ford Motor Co. is removing any suggestion that its fourth-generation compact SUV can venture farther off road than the parking lot of a warehouse shopping club. The 2020 Escape, on sale this fall, is lower, wider and longer than the current model. Its carlike styling includes a shield-shaped grille inspired by the Mustang, one of the few survivors in Ford’s purge of traditional passenger cars. The lower front end borrows from the $450,000 Ford GT supercar. Under its sporty new look is an array of efficient powertrains, including a standard 1.5 liter, turbocharged 3-cylinder engine. Engineers expect it to put out 180 horsepower and 177 pound-feet of torque on premium gasoline. Ford also will launch the 2020 Escape with a hybrid that can run on electric-only power up to 85 mph, a plug-in hybrid and two turbocharged four-cylinder engines. The crossover will make its public debut at the New York International Auto Show this month. The Escape is Ford’s second-best-selling vehicle behind the F-Series pickup trucks. Since debuting in 2001, more than 4.5 million Escapes have been sold in North America. More than 98 percent of them are still on the road, according to IHS Markit. Where Escape once had few competitors, today it competes in the industry’s largest and fastest-growing segment. Compact SUV sales grew 12.6 percent in 2018, topping 3.5 million units. Ford predicts the number of entries will expand from 22 to 30 by 2022. Sales of the Escape dropped 12 percent to 272,228 units last year. Escape was the fifth-best selling compact SUV, behind popular crossovers like the Toyota RAV4 and Nissan Rogue and ahead of the rising Jeep Cherokee. Ford’s answer to these challengers is to target a single group of buyers. Ford can do this because it plans another utility vehicle following the Escape, said Hua Thai-Ting, Ford’s executive vice president of product development and purchasing. Timing and a name will be announced later, Thai-Ting said. The follow-on compact SUV is expected to be a rugged entry that media and analysts call the “Baby Bronco,” after the full-size Bronco SUV returning to Ford’s lineup as a 2021 model after a 25-year hiatus. The Escape’s sloped roofline and compact stance are deceiving. Head, shoulder, hip, knee and legroom measurements all eclipse those of the current model. Gasoline-powered versions feature a sliding second-row seat that offers six additional inches of legroom. 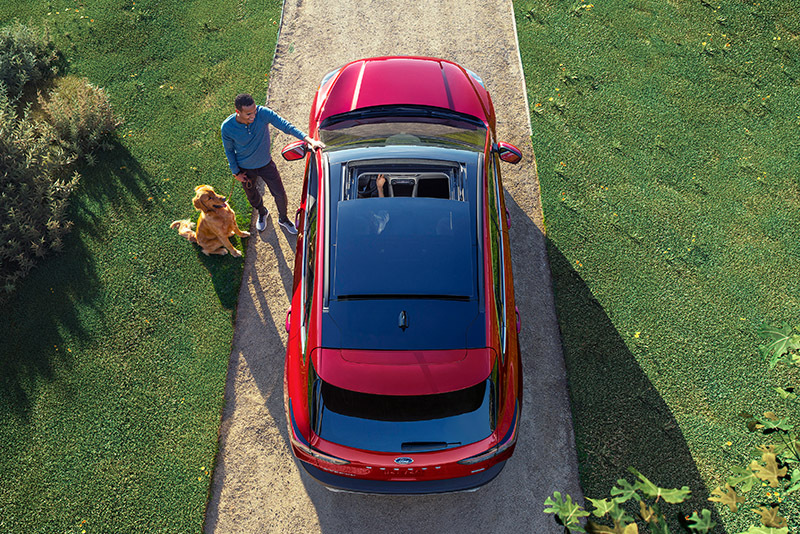 When in the full-forward position, the rear cargo area expands to 37.5 cubic feet, enough for four bags of golf clubs or a full-size dog crate. 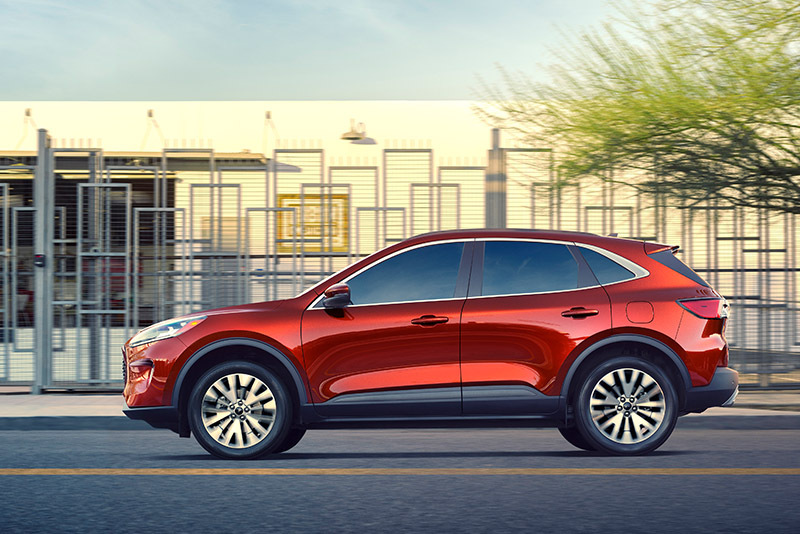 Customers, however, may see the Escape as small compared with the latest Toyota RAV4, Honda CR-V and Chevrolet Equinox models. “AutoPacific’s research consistently shows that Americans like their SUVs to look big and substantial even if they’re aren’t,” Kim said. 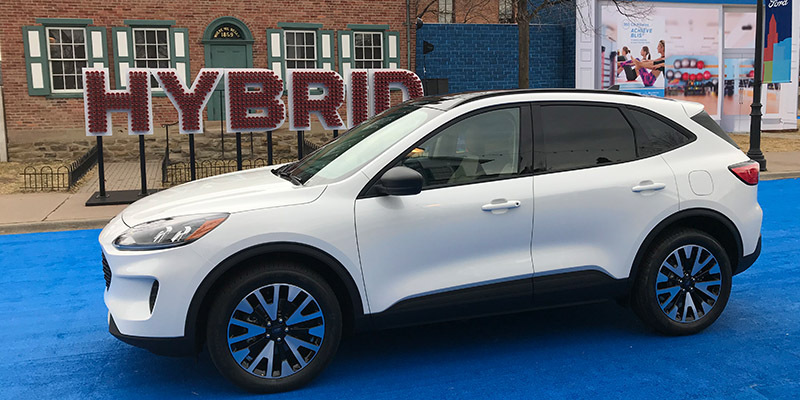 Two new hybrid powertrains propel the 2020 Escape as the auto industry embraces electrified vehicles. The fourth-generation hybrid system standard on Escape SE Sport and Titanium models provides a combined 198 horsepower and total driving range of 550 miles. The electric-only top speed is an estimated 85 mph. Ford’s first Escape plug-in hybrid arrives in early 2020. It is shooting for an EPA-best 30-plus miles of electric-only range. The battery charges in about 11 hours using a 110-volt charging cord. A 240-volt charger drops that to about 3.5 hours. Both hybrid models feature four settings, including a new EV Charge mode that charges the battery to 80-90 percent of capacity while driving, generating electric-only miles to use later. “You do burn more fuel, but it’s really about giving you the flexibility to drive the way you want and manage the energy,” said Alan Dona, Ford hybrid calibration manager. In addition to the small engine, Ford will offer a new 2.0-liter EcoBoost engine in the top-of-the-line Titanium. It is projected to produce up to 250 horsepower and 275 pound-feet of torque. It is capable of towing 3,500 pounds. The Escape comes closer to the realm of device than machine. A 12.3-inch all-digital instrument cluster also used on the GT, Mustang and new Explorer shows a color graphic for each ride setting – normal, eco, sport, slippery, plus snow and sand conditions. An 8-inch touch screen standard on the SE and higher-level trims displays optional Sync 3 connectivity, which is compatible with Apple CarPlay, Android Auto, Ford+Alexa and Waze navigation. Titanium models offer a 6-inch head’s up display on the windshield for directions and other info. The Escape accommodates up to 10 internet-enabled devices up to 50 feet from the vehicle. Two of four plugs offer fast-charging USB-C connections along with three 12-volt sockets. The Escape comes standard with Co-Pilot360, a system of 17 sensors, two cameras and radar. It controls automatic emergency braking, blind-spot monitoring and a lane-keeping system that can nudge a drifting car back into its lane. Optional driver convenience systems include adaptive cruise control that will automatically restart within three seconds of a stop. Lane-centering technology provides an added layer of driving safety by detecting lane markings to prevent the Escape from drifting out of its lane. A new feature called evasive steering assist lets the driver choose to steer around a stopped car or obstacle in its path, canceling automatic emergency braking. The 2019 Ford Escape is a five-seat car-based SUV that competes with the Hyundai Santa Fe, Toyota RAV4 and Honda CR-V.